There are many types of tanks that require some sort of waterproofing. 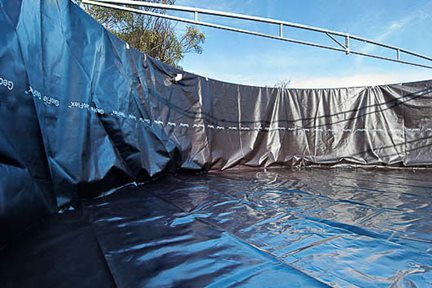 Layfield can provide formed tank liners for small tanks or can install a liner in a large tank on site. We also can line concrete tanks with concrete anchor sheet or other specialized materials. Layfield also supplies large (100 ft/30 m diameter) steel open-topped tanks for water containment. Layfield’s featured tank products include our new Westeel water containment tank. These round tanks are available lined with a Layfield liner for many different containment applications. Layfield’s drop-in tank liners are made from many different types of geomembranes to suit the contained liquid. Concrete anchor sheet is used by Layfield’s construction group to line large cast-in-place concrete tanks in water and wastewater applications.